Of all of punk rock’s schoolyard taunts, “selling out” is the one that’s always served as a catchall for any number of indiscretions. If a band left an indie label for a major, the the band was sellouts. If a band moved its sound toward something more commercial, the band was sellouts. If a group changed its appearance, oh you better believe its members were sellouts. American Steel was never able to make a major label jump, but on its third album, 2001’s Jagged Thoughts, it put an acoustic guitar on the album cover and dropped its gruff, East Bay punk stylings for the vintage sounds of The Clash. This, too, was enough to get the band shouted down, even as it was offering up the best record of its career. There’s little about Jagged Thoughts that feels married to what was happening in punk rock circa 2001. While the band’s 1999 album Rogue’s March was a mile-a-minute rager that fit right in other gruff punk acts like Hot Water Music, Jagged Thoughts was the band’s equivalent of Jawbreaker’s Dear You, a record that brought about the group’s break-up even as it was breaking new ground. From the start of Jagged Thoughts it’s as if American Steel sets out to alienate every fan waiting to dismiss it. The heavily processed flange on the guitars that open “Shrapnel” is a far cry from anything traditionally punk, but it’s the album’s centerpiece, “Maria,” that would cause any lingering punk purists to jump ship before the track even hit its first chorus. Where the dual guitars of Rory Henderson and Ryan Massey previously struck nerves, on “Maria” they’re content to strut, with staccato strikes and bluesy lead lines anchoring the first two minutes. It’s here that Henderson offers his best take on Joe Strummer’s soulful balladeering, offering a romantic ode that only sees the energy upped when it hits its rambunctious refrain. It’s in that transition from subdued verse to punk-ish chorus that American Steel shakes off its past without dismissing it either. When the band returned to the studio a year later, it’d be even further away from punk, so much so that American Steel would draw a line in the sand and change its name to Communiqué. 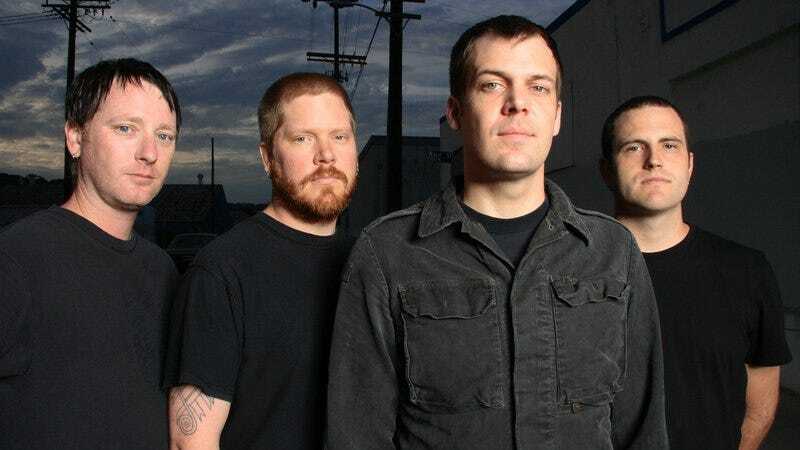 When American Steel proper returned in 2007 with Destroy Their Future, the band would neither abandon what it learned during its time spent crafting hooky synth-rock as Communiqué, nor return fully to the sound of Rogue’s March. Ultimately it benefitted from this break, giving those that once cried foul at Jagged Thoughts a chance to be taken by the group’s charms, replacing fans’ cries of “sellout” with singalongs to “Maria” instead.